The smartest Princess in the Kingdom (Or is she just arrogant?) and her brother, the strongest Prince in the Kingdom (Or is he just a bully? ), who have to save their Kingdom. Together they discover that the most powerful weapons are not swords, that dragons can be slain by a good bedtime story, and sometimes having a brother or sister isn't such a yucky thing after all. This delightful children's play combines storytelling, exciting swordplay, comedic physicality, and sensitive characters. At most performances, young audiences joined the actors after the show to discuss stage combat, (Girls can be good at it! 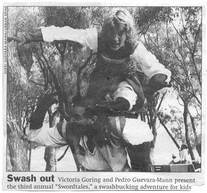 ), historical use of swords, and the themes within the plays. 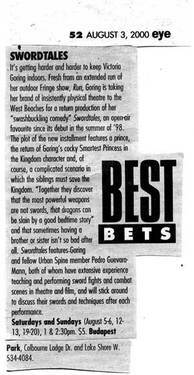 Highly entertaining to adults and children ages 4-11, Swordtales is ideal for schools and special events. 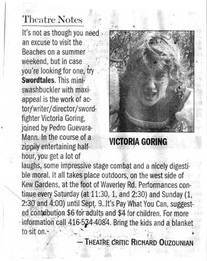 Whether performed in a park or on stage, Swordtales is guaranteed to delight.